Damion Lucas, right, with his brother, Frankie. Damion’s killing set off an investigation that raised questions about connections between the drug world, the police department, and the mayor’s office. Courtesy of Vince Wade. A thirteen-year-old boy is murdered in a drive-by shooting. The Detroit police quickly apprehend a suspect. But the FBI is convinced that the wrong man is in jail — and that the real killers are escaping justice thanks to friends in high places. Three years after Damion Lucas was killed, the case remained unsolved. 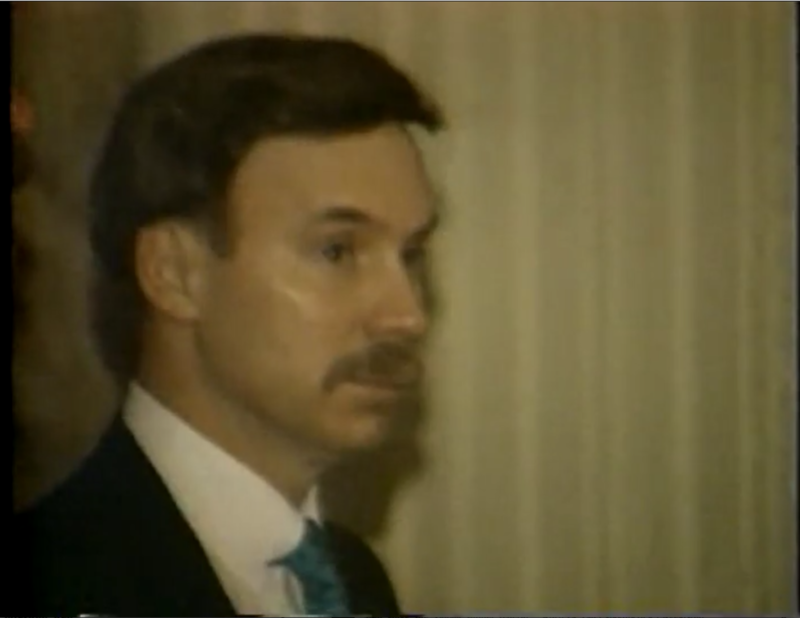 Vince Wade made a five-part TV news series about the stalled investigation and apparent coverup. Courtesy of Vince Wade. Leon Lucas suspected that Johnny Curry’s drug organization was behind the his nephew’s murder. Lucas owed the Curry brothers for a package of heroin lost in a police raid, and he believed they shot up his house as retribution. Courtesy of Vince Wade. Vince Wade was an investigative reporter in Detroit for years. While he was unable to find direct evidence that Mayor Coleman Young was personally corrupt, the Damion Lucas case raised questions about whether the police had covered up the murder to protect Cathy Volsan, the mayor’s niece. Courtesy of the Detroit Free Press. LeKeas Davis had been in a fight with Leon Lucas the week prior to the drive-by shooting. So the Detroit Police Department arrested Davis for Damion’s murder, even though Leon insisted Davis had nothing to do with it. Courtesy of Vince Wade. 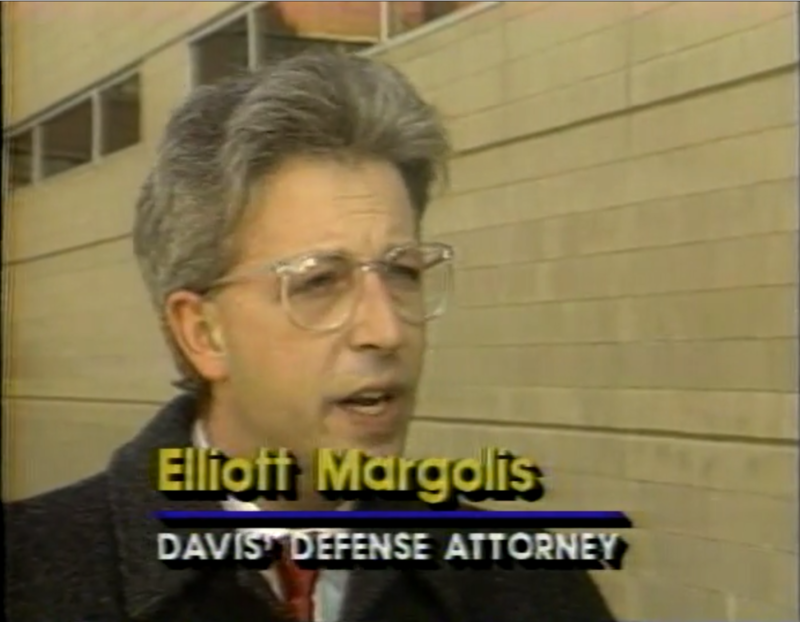 Elliot Margolis was LeKeas Davis’s lawyer. 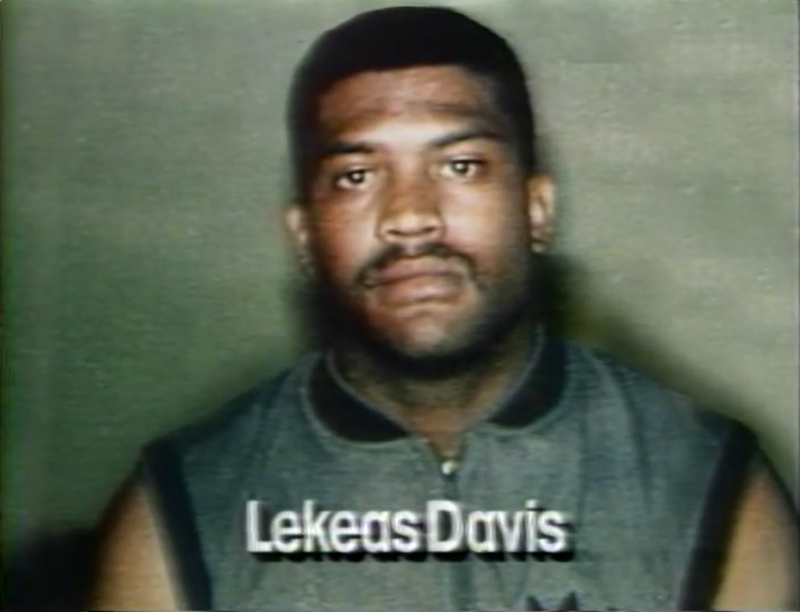 He was convinced that LeKeas Davis was innocent, but he initially had trouble getting the case dismissed. Davis spent almost ten months in jail. Courtesy of Vince Wade. FBI Agent Herm Groman was working on a federal drug task force when he came across information suggesting that the Curry organization was behind the shooting of Damion Lucas. He took that information to the Detroit Police Department, but they did not pursue the lead. Courtesy of Vince Wade. In addition to evidence from pen registers and wiretaps, the FBI received information from confidential informants that members of Johnny Curry’s drug organization were behind the shooting of Damion Lucas. FBI Agent Herm Groman used pen registers to monitor Johnny Curry’s incoming and outgoing calls. Looking through Curry’s phone records, Groman saw that Johnny made calls right after the murder of Damion Lucas to the home unlisted telephone number of Police Sergeant Jimmy Harris. Courtesy of Vince Wade. Detroit Police Sergeant Jimmy Harris worked security for Mayor Coleman Young’s niece, Cathy Volsan, who was married to drug kingpin Johnny Curry. His unlisted phone number showed up in the pen register records collected by FBI Agent Herm Groman, and his number was found on a card in Johnny Curry’s house. Courtesy of Vince Wade. 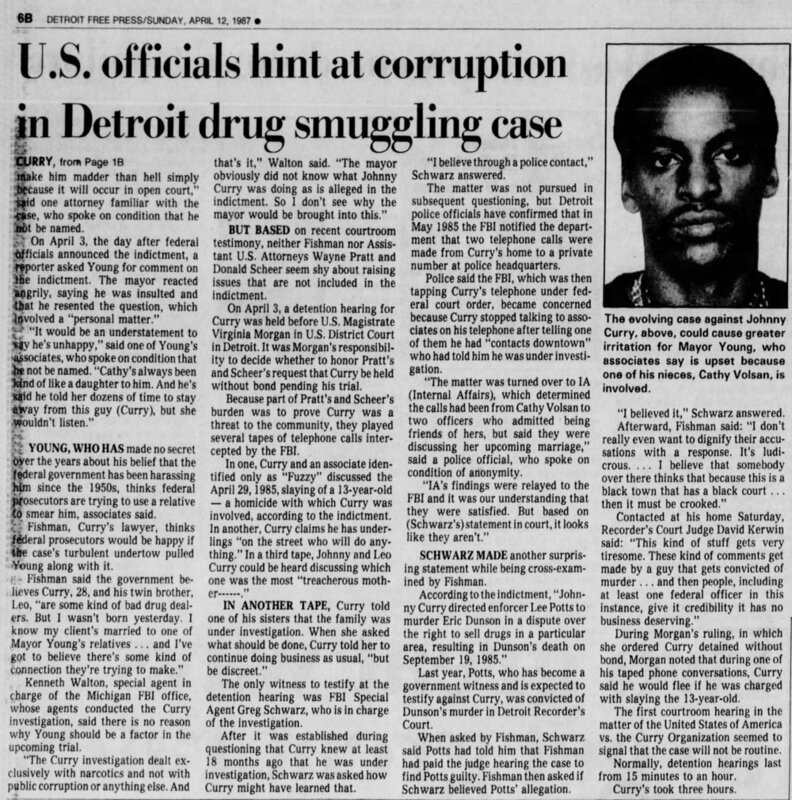 Groman began to suspect that the corruption at the Detroit Police Department went as high as Gil Hill, who oversaw the homicide department. Hill maintained that he did not tip off the Curry drug organization. But Johnny Curry later admitted to regularly bribing Hill. Courtesy of the Detroit Free Press. Coleman Young was never directly implicated in any wrongdoing in relation to the murder of Damion Lucas. But the FBI suspected that Young took measures to ensure that the murder investigation would not impact his niece, Cathy Volsan. Courtesy of the Detroit Free Press. FBI Agent Gregg Schwarz also investigated the Curry drug organization. He was there during the raid of Johnny Curry’s house, where he found a card with unlisted private numbers for Inspector Gil Hill and Sergeant Jimmy Harris. Courtesy of Vince Wade. Crimetown is Marc Smerling and Zac Stuart-Pontier. This season is made in partnership with Gimlet Media and Spotify. This episode was produced by Samantha Lee, Austin Mitchell, John White, Rob Szypko, and Soraya Shockley. The senior producer is Drew Nelles. Editing by Zac Stuart-Pontier and Marc Smerling. Additional editing by Ryan Murdock. Fact-checking by Jennifer Blackman. This episode was mixed, sound designed, and scored by Sam Bair. Original music this season composed by Homer Steinweiss. We recorded some original music at Rustbelt Studios in Detroit in partnership with Detroit Sound Conservancy. Special thanks to Carleton Gholz and Maurice “Pirahnahead” Herd. Additional music by Kenny Kusiak, John Kusiak, and additional mixing by Bobby Lord. Our theme song is “Politicians In My Eyes” by Death. Our credit music this week is “Keep on Rockin’ It” by EZB and DJ Los. Archival research by Brennan Rees. 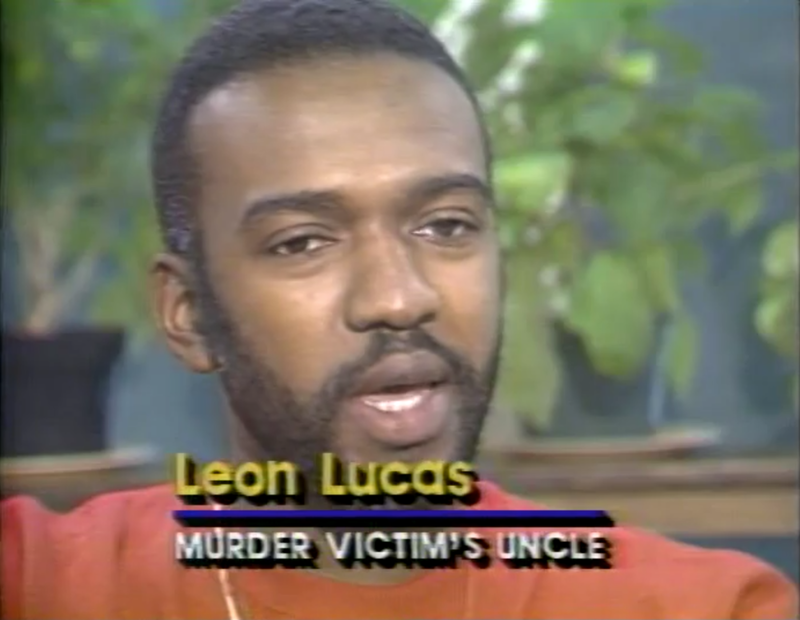 The TV report on Damion Lucas’s murder appears courtesy of Vince Wade. Vince just came out with a book called “Prisoner of War: The Story of White Boy Rick and the War on Drugs.” Additional archival material courtesy of the Detroit Historical Society. Show art and design by James Cabrera and Elise Harven. Thanks to the Detroit Free Press, Peter Bhatia, Jim Schaeffer, Mary Schroeder, Mary Wallace, the Walter P. Reuther Library at Wayne State University, Melissa Samson, the Charles H. Wright Museum of African-American History, Bill Gray, Martin Torgler, Ralph Musilli, Evan Hughes, Rashard Cardon, Keith Terry, Kevin Greene, Zak Rosen, and everyone who shared their stories with us. Detroit is an amazing place, and we’re honored to tell a small part of its story.